Meet Joan Son and learn how to make your own origami butterflies. Houston artist Joan Son brings her stunning exhibition Time Travelers to the Pearl in the Summer of 2015. 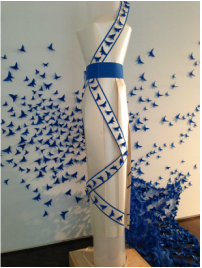 Intricate origami and paper artwork inspired by a childhood passion for designing paper doll dresses graces the Rebecca Cole Gallery, and interactive origami-folding stations allow visitors to contribute their own creations to the Pearl's walls.